I greet you, my dear friends, with this greatest of holidays, the Nativity of our Lord Jesus Christ. Recently we have heard the Sunday Gospel reading about the sumptuous feast to which many were summoned, but few were chosen. 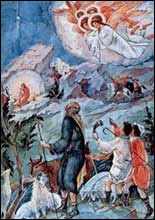 Today we are celebrating this very feast, with the only difference being that it is no longer His servants whom the Master has sent to invite us to the feast, but today He Himself has come, He has come down to earth and has taken upon Himself the form of man, in order to invite us to His feast of eternal joy, His feast of heavenly bliss. And how will we respond to this invitation, my dear friends? Let us first look at the response of those who were invited 2,000 years ago. At that time there were many who were invited. Invited were the Jewish scribes and Pharisees, the so-called keepers of the church law; they had received their invitation from God’s servants - the prophets, and they knew very well the time when the Messiah was due to appear on earth, but they, being filled with pride, lust for power and evil intentions, rejected their invitation and for this were rejected themselves. Invited also was King Herod, who learned of the feast from the magi: but he did not discard his earthly concerns, like the scribes and the Pharisees he did not discard his pride and lust for power, and because of it he was filled with evil, intending to kill Christ, and so he became the murderer of a multitude of innocent babes; for this he lost his invitation and was rejected. Invited were the simple shepherds, who were told of the feast by the angels: they left their earthly concerns and came to kneel before the Infant Christ, and so they found themselves among the chosen. Invited were the magi, who were informed of the feast by the divine star: they came from far-away countries, they suffered the hardship of a long journey, in order to come and worship the newborn King and God, and so they, too, were among the chosen. And what about us, my dear friends? What will we do? All of you who are now here, have obviously responded to the invitation which you had received through the Church, and have come today to worship the Infant Christ, our Saviour. For this you are now among the chosen. But you must work hard to safeguard this chosenness, for it is very easy to lose - be it through sin, or simply by scattering it among daily busyness and attachment to worldly things. Let us apply all our efforts to remain at the eternal feast of our Lord Jesus Christ. And to do so more easily, let us be guided by the words of the first ode of the Christmas canon: “Christ is born - glorify Him! Christ comes from the heavens - meet ye Him! Christ in on earth - be ye exalted!” This means: Christ is born as man - let us glorify Him, let us worship Him, let us try to emulate Him, let us follow His teaching, let us keep His commandments. Christ has come to us from the heavens - let us meet Him with prayer, meet Him in His house, i.e. the church, let us faithfully attend all church services. Christ remains on earth with us through His Church - let us be exalted, let us rise upwards in our thoughts, thinking more about heavenly things rather than earthly ones. Les us concern ourselves less with worldly affairs and more with our eternal life. Thus, by glorifying the Infant Christ, Who was born for our salvation, with church services and home prayers, by meeting him with our souls and our lives, by lifting up our thoughts and our actions towards the heavenly, the divine, - we will emulate the shepherds and the magi, and together with them, and all the saints, we will be the chosen ones at the joyous feast of eternal bliss. Amen.